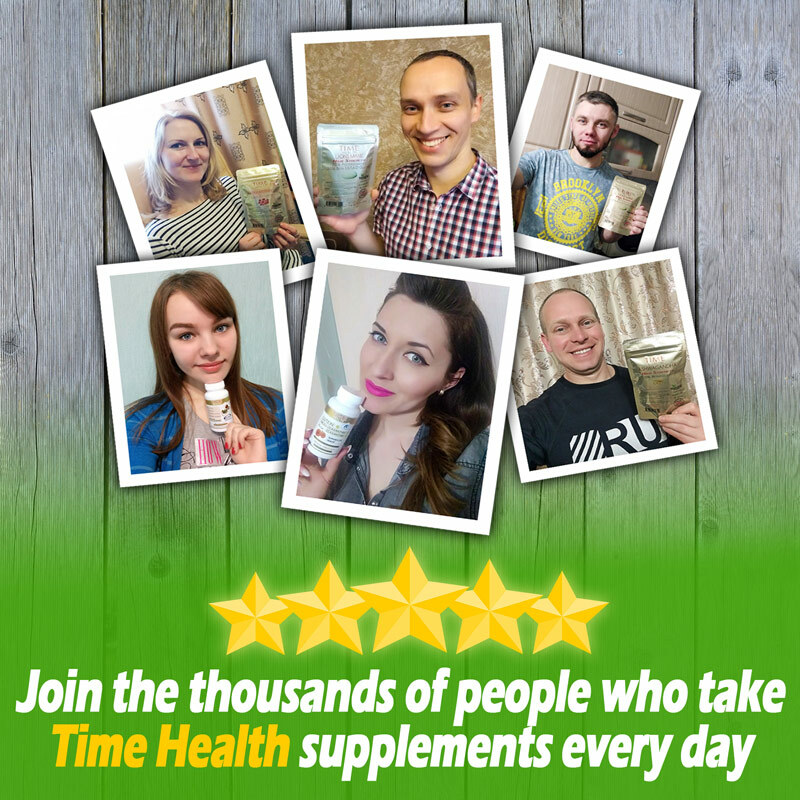 ✔️ 100% natural Mushroom Complex 6 MAXIMUM STRENGTH is an equal mix of six different high strength mushrooms extracts, Chaga, Cordyceps, Shiitake, Reishi, Lions mane and Maitake giving a broad full-spectrum, high potency, complete mushroom formula. ***Only the most complex part of the mushroom is used – the fruit body. ✔️DUAL EXTRACTED. (alcohol/water) water-soluble and the non-water-soluble bio actives. Beta glucan content is between 8% and 12%. ✔️3RD PARTY TESTED. Our Mushroom Complex 6 powder is 3rd party tested. 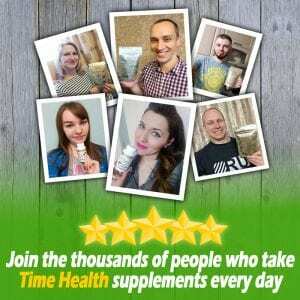 ***This product is the powder version of our best-selling Mushroom Complex 6 capsules. Cordyceps militaris extract : 30% Polysaccharides – Cordycepin 0.1% – Grown on organic gluten free grain. Chaga extract : 30% Polysaccharides – 2% Triterpenective grown wild on Russian birch trees. Lions Mane extract : 30% Polysaccharides – wild grown on hardwood sticks. Maitake extract : 30% Polysaccharides – wild grown on hardwood sticks. Reishi extract : 30% Polysaccharides – 2% Triterpene – wild grown on Duanwood logs. 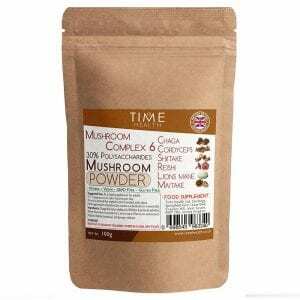 Shiitake extract : 30% Polysaccharides – wild grown on hardwood sticks. 1 to 2 grams per day. 1 teaspoon equals 2 grams. I am not personally using this item, but I'm giving it to a member of my family, so impossible to say!. Mixes readily into juices, water,smoothies and blended food, however. Easy to use. I ordered the powder by mistake, having previously ordered the capsules. It mixes well and does not dramatically alter the taste of the breakfast foods that I mix it with. It will last some time and appears to be better value than the capsules. Full marks to Time Health for double bagging these powders, because sometimes accidents can happen! I had previously been using the Mushroom Complex 6 capsules but was opening them up and tipping them into my coffee, so I saved myself the hassle and got the powder instead. 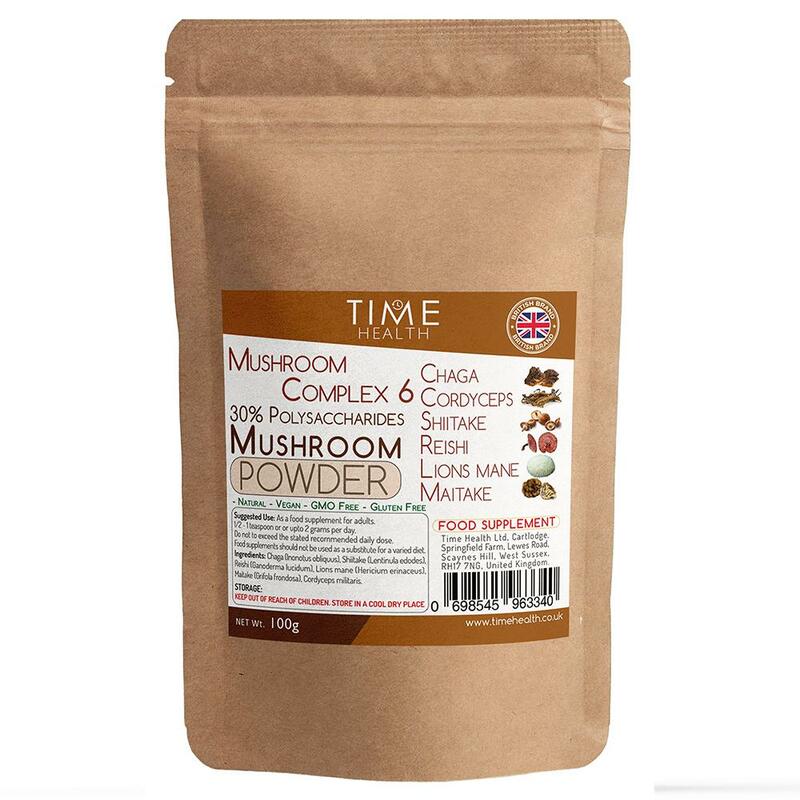 These are good, and saves having to get the mushroom extract powders separately which would be a bit of pain to mix. Convenient, healthy and double-bagged for safety - what more can you ask for?